I'm on a crafting roll, if you will. Having finally finished the banner that took, well, we won't say just exactly how long it's been a work in progress, I can look forward to something new. This new project will be the mug with the cross-stitch insert. I took the mug apart and removed the "fabric" on which to do the design. 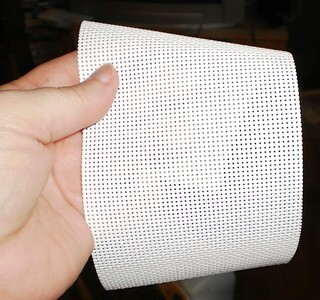 It sure looks like regular cross-stitch fabric but it's plastic, a very malleable plastic. If you've done needlepoint on plastic canvas, this is nothing like that. It's got the weight of Aida 14-count cloth but is clearly plastic. I would imagine cloth would not hold up to the rigors of a mug, although I don't think the recipient will actually use this as a mug. Knowing him, he'll store pencils in it. It stitches just like cross-stitch fabric, however. I had this grandiose design for the insert but, after spending 90 minutes stitching, I think my idea is too big. Still, this is fun and it will go very fast. There are but two colors to this project so I don't have to worry about losing a skein and, wonder of wonders, I actually had the color I needed. This gives me a push to work on the deck chairs. This is the kind of project that lends itself to a Saturday afternoon outside. Put my feet up on the ottoman, a cold glass of water at my side and spend three hours just stitching with the sounds of summer surrounding me.